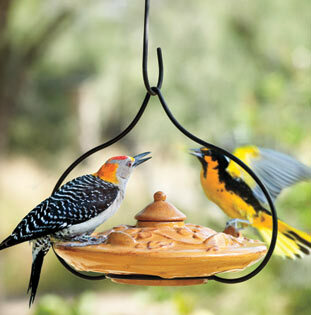 Choosing ceramic bird feeders will add originality and class to your backyard. Unique bird feeders made by local potters or by yourself will be a treat for wild birds and human visitors. 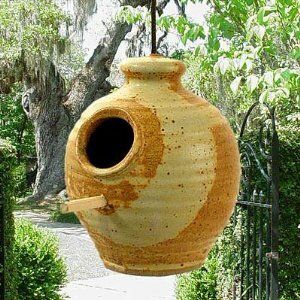 We have chosen our best handmade, natural stoneware backyard feeders. Pottery feeders are great for areas where it gets really cold and snowy in winter. Glass and plastic bird feeders deteriorate in the cold temperatures, ceramic feeders don't. 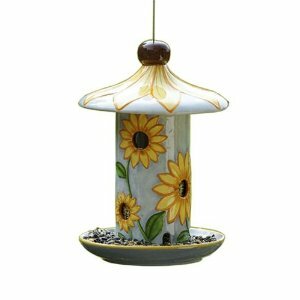 Hang your ceramic feeder in a spot where the wind won't blow it against a branch or window - you don't want it to get damaged. Since most pottery bird feeders are not see-through, you will have tocheck the level of the seed regularly. Be aware of the eating habits of your local birds and how much they are consuming, and keep friends with them by making sure they always have food. Keep your pottery feeders clean, as you would with any bird feeder. A charming addition to any garden! This hand painted ceramic feeder has circle cut outs which allow you to see the seed level in the plastic tube inside the feeder. Holds 1.5 lbs of wild bird or black seed. The top lifts for easy filling - a nice feature! And it includes steel cable for hanging. Sturdy and well-finished, it will withstand harsh weather conditions. The seed is protected in a small opening which keeps large birds (and squirrels, usually) from feeding. Perfect for smaller songbirds who usually don't get a chance around larger birds! Each feeder is hand thrown on the potter's wheel in the mountains of North Carolina. This stoneware feeder is available in royal blue and butternut colors - and the colours are gorgeous! The high-fired pottery process prevents the feeder from fading and is unaffected by harsh weather elements (including ice). Comes with a drainage hole, wooden perch and nylon cord hanger. Try using a metal chain or something stronger for the hanger - more squirrel proof. This is a beautifully crafted feeder. Choose a colour to match your bird bath or other garden decor.